Elizabeth Feinler pioneered and managed first the ARPANET, and then the Defense Data Network (DDN), network information centers (NIC) under contract to the Department of Defense (DoD). Both of these early networks were the forerunners of today’s Internet. Her group developed the first Internet “yellow-” and “white-page” servers as well as the first query-based network host name and address (WHOIS) server. 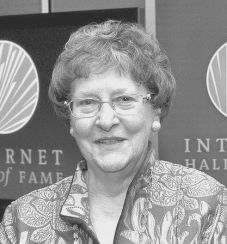 Her group managed the Host Naming Registry for the Internet from 1972 until 1989. As part of this effort, she and her group developed the top-level domain-naming scheme of .com, .edu, .gov, .mil, .org, and .net, which are still in use today. She was appointed Delegate at Large to the White House Conference on Libraries and Information Centers; has been a member of ACM, ASIS, IEEE, and was a founding member of the Internet Engineering Task Force. In 2000, she was inducted into the SRI Alumni Hall of Fame.